1,000,000 slices from 100,000 images shared on Twitter in Los Angeles during summer 2013. 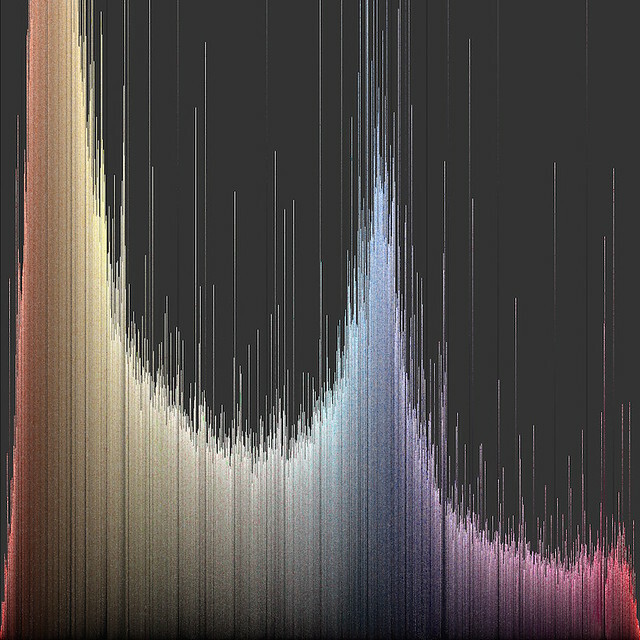 They are visualized as hue histogram vertically sorted by brightness. Author: Damon Crockett. 28 speakers; 100 people registered to attend. "This workshop focuses on developing computational and mathematical techniques for the analysis of large sets of cultural artifacts beyond text, and includes considerations of material and graphic design, architecture, fashion, interactive media, games, film, photography, music, painting, performance, and the kinesthetic dimensions of culture. The analysis of audio and visual data requires a different set of quantitative techniques than those devised for textual analysis. This challenge has become all the more acute, as every day individuals and institutions produce and publish hundreds of millions of digital cultural artifacts that are not text. The big data revolution is not only a text-based one, and these enormous new resources of non-text culture require equally revolutionary techniques for meaningful analysis. The event will highlight novel methods for examining the multidimensional aspects of these cultural expressive forms. Aspects include structural configuration, dynamics in time and space, the changing social implications of artistic production and reception, and the cognitive multiplicity of perception and action, from genesis to memetic diffusion. The workshop aims to provide a point of reference for future research. By identifying and addressing pain-points, conceptual differences, and radical opportunities across the disciplines, our conversation has the potential to facilitate new scholarship in the arts, design, computation, information science, applied mathematics, and the physics of culture."